"Mazbatayi ver, mazbatayi ver, mazbatayi ver, Imamoglu'na!" The Besiktas fans are chanting before their home match against local rivals Istanbul Basaksehir and it is very, very loud. Football in Turkey's biggest city always means colour, passion and noise, but Saturday's game was being played in special circumstances, between two very different clubs. Istanbul is going through tense, uncertain times. Recent local election results show President Recep Tayyip Erdogan's favoured candidate was defeated here, but his ruling party have refused to accept the outcome and ordered a recount. 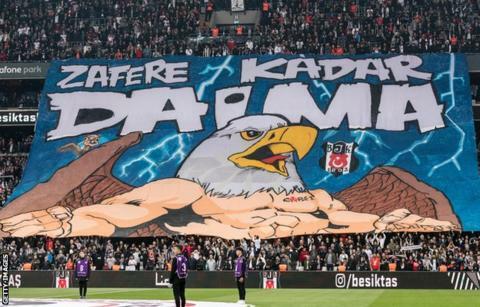 The chant the Besiktas fans were singing calls on Erdogan to "hand power to Ekrem Imamoglu", the 'winning' candidate who was at the match, sitting beside Besiktas' chairman. This is Turkey in a nutshell - politics and football are intertwined, there is no escaping it. As for Basaksehir, league leaders and a new power on the scene, they have close ties to Erdogan. Founded in 1990 as an amateur side, they rose rapidly through the leagues and reached the top flight for the first time in 2007. But it was in 2014 when their fortunes really started to change. That was when a group of businessmen close to Erdogan's ruling AK party took over. Former Turkey manager Abdullah Avci was appointed manager and Goksel Gumusdag came in as club president - he is married to the niece of Erdogan's wife Emine. While Tottenham rolled out club legends Paul Gascoigne and David Ginola for the opening of their new ground in March, Basaksehir fielded Erdogan himself as they unveiled a new 17,000-seater stadium in July 2017. A former semi-professional player, Erdogan scored a first-half hat-trick in a 9-4 victory for his side in a remarkable display, with newspaper Daily Sabah likening his second goal, a chipped effort, to something Barcelona's Lionel Messi would score. Erdogan wore the number 12 shirt in that game and was voted in as the country's 12th president a month later. Basaksehir paid tribute by officially retiring the squad number. Basaksehir may have reached the top of the Turkish table but many see their route as an artificial one, relying on outside investment that has paid for new players and a new stadium. Their average gate is about 4,000 but many believe only a quarter are paying spectators, with the remaining tickets bought by sponsors or handed out to schools and people living in the local area. Their success rankles rival supporters, especially those of Besiktas, a club that pride themselves on being Turkey's oldest. They were established in 1903, pre-dating the nation itself - the Republic of Turkey was officially proclaimed in 1923. "I have lived in Istanbul all my life and I have never met a single Basaksehir fan," Besiktas supporter Cagri says before the two sides meet on Saturday. "This is not a derby, it will never be. They are a fake club and have no history. I don't have any feelings, any nerves about playing them and everyone else feels the same." If Basaksehir are a 'pro-government' and 'pro-Erdogan' club, Besiktas can be seen to stand for exactly the opposite. During the afternoon before the game, the narrow winding streets of Istanbul's Besiktas district were a sea of black and white. Anyone wearing another team's colour might have found themselves in a spot of bother. The club's Carsi ultras congregated around a statue of a black eagle - the team's emblem - and as a man circled around me smashing a drum, a little too close for comfort, you could still make out the afternoon azaan (call to prayer) ringing out among the mosque minarets that dominate the skyline. There is one especially dramatic story that says a lot about the Carsi group's politics. In 2013, what started as minor peaceful protests against the demolition of Istanbul's Taksim Gezi Park turned into long and large-scale anti-government demonstrations. The flashpoint appeared to come when police used tear gas in an attempt to disperse campaigners. In the long, violent clashes that followed, thousands were injured and 22 people died. As the protests grew in Istanbul, members of the Carsi group hotwired a bulldozer that had been left outside Besiktas' ground while it was undergoing renovation, and used it to push back the police's water cannon. Blood has been shed on the streets of Istanbul going back centuries, and as recently as 2016, when a military coup attempted to overthrow Erdogan's government and failed. More than 250 people died. Although Gezi Park has since reopened, it was closed again on Saturday. A large police presence had cordoned off the area with anti-riot vehicles amid rumours President Erdogan was about to declare the local election results void. After Saturday's match there is a more joyous mood among the Besiktas fans. After 90 minutes of singing, smoking and bouncing there is a victory to celebrate, too. Ex-Real Madrid and Manchester City forward Robinho, 35, had put Basaksehir ahead. The Brazilian is one of several ageing big names to have arrived in recent years, joining ex-Arsenal and City striker Emmanuel Adebayor, also 35, and former Chelsea striker Demba Ba, 33, in a team captained by former Newcastle midfielder Emre Belozoglu, 38. But the home team scored twice to win 2-1. Despite defeat, Basaksehir were still eight points clear of third-placed Besiktas. Yet the result meant their closest challengers could narrow the gap across town on Sunday, in the city's biggest derby of all, between heavyweights Fenerbahce and Galatasaray. With the two teams situated on opposite banks of the Bosphorus, their games are known as the 'Intercontinental Derby' - Galatasaray are based in Europe and Fenerbahce in Asia. Divided by social and cultural differences, they share a bitter rivalry. Galatasaray are seen as representing the elite, formed by students from Galatasaray High School, the oldest in Turkey. To this day you are required to be a graduate to be a member of the team's board. Fenerbahce, meanwhile, are seen more as the 'people's club'. Between them they have won 40 of the 62 Super Lig titles contested since the league was formed in 1959. Nowadays, however, the landscape is a little different. Financial fair play sanctions from Uefa have limited their spending power, and both have been forced to promote youth players from the academies who have not been good enough. While Galatasaray are Basaksehir's closest challengers for the title, Fenerbahce are fighting against relegation. Their squad has been described as "really poor" and at its "weakest for 20 years". As fans piled on to the ferry to cross the Bosphorus before the game, I spotted a man dressed in a full Fenerbahce tracksuit. Staring across the water with a blank expression, he had the look of a man riddled with pre-match nerves. Savac was his name. "From Istanbul?" I asked. "No, from Frankfurt in Germany." It was only his third game at the Sukru Saracoglu Stadium but he was far from alone in having made the trip over. I was told up to 3,000 others had done the same, including Okan from Munich. "I don't support Bayern," he said. "My family are Turkish so we support teams from here. My father is a Trabzonspor fan." The 22-year-old has been to every home game with his friend Tim since 2015, staying a few days each time. It costs them around £4,500 a season in tickets, travel and accommodation. The obsession is clear to see. The 20-minute trip across the water brought us to Kadikoy - Fenerbahce heartland. You are immediately hit by the yellow and blue coloured shirts, scarves and flags but what struck me most were the Galatasaray fans walking around freely without any hassle at all. Before making the trip to Istanbul, a reaction I heard from many people was about potential danger here. "Stay safe," they said. "Keep out of trouble." Asked if they had been to the city, the response was no. The killings of Leeds United supporters Christopher Loftus and Kevin Speight before a 2000 Uefa Cup semi-final against Galatasaray perhaps remain in the forefront of people's minds, almost 20 years on. In his book 'Welcome to Hell? In search of the real Turkish football', Ankara-based British social anthropologist Dr John McManus explored the issue of football violence and hooliganism in the country. The phrase 'Welcome to Hell' stems from Manchester United's Champions League visit to Galatasaray in November 1993, when Eric Cantona, Ryan Giggs and company were given a particularly hostile reception upon their arrival at the airport. Supporters piled into the old Ali Sami Yen stadium some seven hours before kick-off. McManus wrote: "My own experiences were anything but hellish. When I think about Turkish football, I picture warm-heartedness, camaraderie and ardour in amounts I had never before witnessed. "I think of Turkish-origin Londoners who would pull on a Fenerbahce top and fly halfway around Europe to watch their side play. "In Turkey, I was never made to feel unwelcome. The gap between perceptions and the reality I encountered was stark." After the boat ride it was easy to see what he meant, and around Fenerbahce's ground there was a carnival atmosphere already in full swing a full five hours before kick-off. The wave carried me along. Fans were lining the streets, singing songs and lighting flares. The smoke was so thick it made your eyes itch and got to the back of your throat. There was no let-up. Caught off guard, my heart skipped a beat when a firework let out a huge shuddering blast. The burned-out flares are discarded in the streets in their hundreds, along with the thousands of beer cans and millions of sunflower seed husks, which must have to be swept up by the truck load. Another less innocent pre-match ritual involves holding up traffic in the one-way street parallel to the ground. Excitable supporters then rock cars from side to side. The older the vehicle, the more vigorous the rocking. Those driving Mercedes and BMWs get off lightly. Inside Fenerbahce's Sukru Saracoglu Stadium, a cauldron of a ground, the match itself is a typical derby encounter. The crescendo of whistling from the fans every time Galatasaray get on the ball provides another round of battering to the eardrums. It is a game full of niggly fouls and the home fans are left exasperated when defender Hasan Ali Kaldirim is sent off after the referee consults the video assistant referee. It ends 1-1. Fenerbahce supporters will be heading home the happier. They are still only six points clear of the bottom three, but they at least remain unbeaten at home against Galatasaray since 1998. What is more, they have perhaps even slightly dented their rivals' title hopes. With six games remaining, a draw means Galatasaray have managed to cut the deficit to Basaksehir to five points, but victory would have narrowed the margin to three. Galatasaray will meet the league leaders in the penultimate round of matches this season. A match that may well determine who wins the title. If Basaksehir can hang on, they will become just the sixth club to win the Turkish league since 1959. It will be a historic achievement, no doubt, but only a small number among Istanbul's millions of passionate football fans will be celebrating.